In 1996 Melanie Britz is 20 years old, attending university, overweight, perplexed and wanting, above all, to be liked. What she doesn’t realise is that her life won’t be getting easier any time soon: a friend’s murder, the demise of her parents’ marriage and her mother’s near suicide attempt rocks the very core of her belief in God (and life itself). After years in a joyless maze she realises that her problems cannot be solved from the shallows or the shoreline. She needs to Dive In – into the depths of her mind, the unresolved emotional trauma, her subconscious programming and the hidden parts of the universe she lives in. What she discovers is life-changing. Through the mists of time and space, filled with laughter and tears it is a heartfelt, honest conversation between the Girl and the Woman she becomes. An enjoyable and useful book. It serves as a primer for spiritual growth without seeming intimidating or overwhelming. 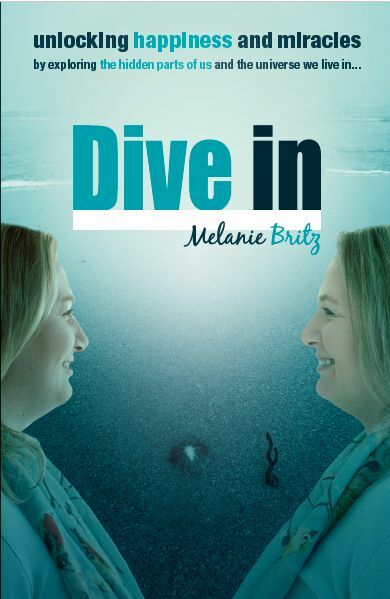 Dive In, by Melanie Britz, is a kind and compassionate book about unlocking the best and truest self in all of us. Written as a letter to her 20-year-old self, each chapter explores a different tool for spiritual health and healing, often in the context of the author’s experiences. Dive In is honestly and thoughtfully written, introducing the reader to a broad range of spiritual practices and psychological techniques. Dealing with topics ranging from mental health to body image to overcoming tragedy, Dive In is an accessible introduction to a variety of coping mechanisms that any reader will be able to find value in. I rate this book 4 out of 4 stars. Many self-help books, especially ones dealing with spiritual health, can be esoteric and intimidating to someone unfamiliar with the practices described. Dive In is the opposite. By writing to her 20-year-old self, Britz takes fairly complex ideas and breaks them down into simple components, often explained with the help of everyday analogies or small illustrations. Helpful footnotes link back to the original material, allowing a particularly invested reader to learn more. The writing is conversational and gives the reader a sense of immediate friendliness and familiarity. Each chapter covers a different concept, and while the concepts build on each other, a single chapter can be revisited easily and often. Likewise, if a few chapters do not ring spiritually true for a reader, they can be skipped without compromising the entire book. Britz even encourages this, saying that her metric for the validity of a spiritual practice is what feels authentic to her. Therefore, even readers who come from an existing faith tradition can still adapt the practices in this book. The interactive nature of this book is increased by the link found at the end; Britz has developed a website encouraging readers to use Dive In as an inspiration to write their own letters to their younger selves and share them with the world. All self-help and spiritual growth is inherently a participatory process, and this book is at its strongest when it is being integrated into one’s daily life. Even the writing style encourages such interaction; at some points the reader, through the form of Britz’s 20-year-old self, is encouraged to try certain activities or simply go outside. Dive In’s conversational tone allows reading it to feel less like a chore and more like a conversation. “Through sharing some intensely personal experiences, Melanie takes us on a journey through her life and her personal growth and development in coping with what happened to her. The book is set in South Africa and spans the period between the mid 1990’s and present time. As a fellow South African, I found it easy to relate to Melanie and her experiences, but her message is universal and I do think anyone, anywhere in the world, would enjoy reading this book. Melanie approaches pervasive issues such as lack of self-esteem, struggles with weight and body-image, and coping with difficult relationships, to name only a few; with honesty, empathy and wisdom. I loved how even the format of the book, written as a conversation with her 20-year old self, teaches us about compassion and positive self-talk!